SRINAGAR: Kashmir can be often handed down as a perfect example of a cartographic metaphor. The term conjures an embellish of distinctive themes. Described by the serene mountains and the tumultuous protests, orchids full of blooms and the endless season of deaths, the name seems a deceit in itself. Kashmir is a place where a floret withers even before fluorescence. Eighteen-month-old Hiba Nisar, the youngest pellet victim in Kashmir. 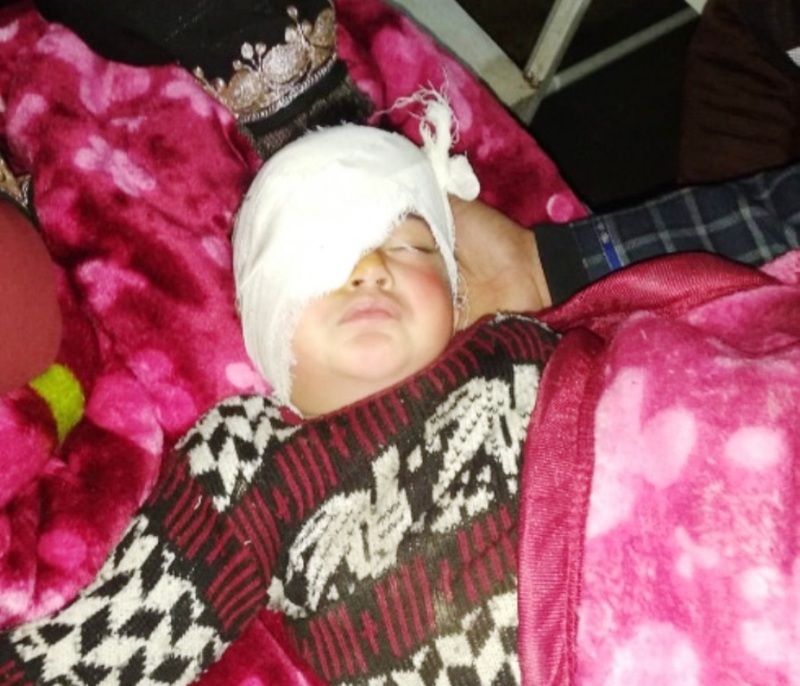 Hiba was hit by pellets on Sunday, November 25, 2018 at her home in Kapran village of Shopian. 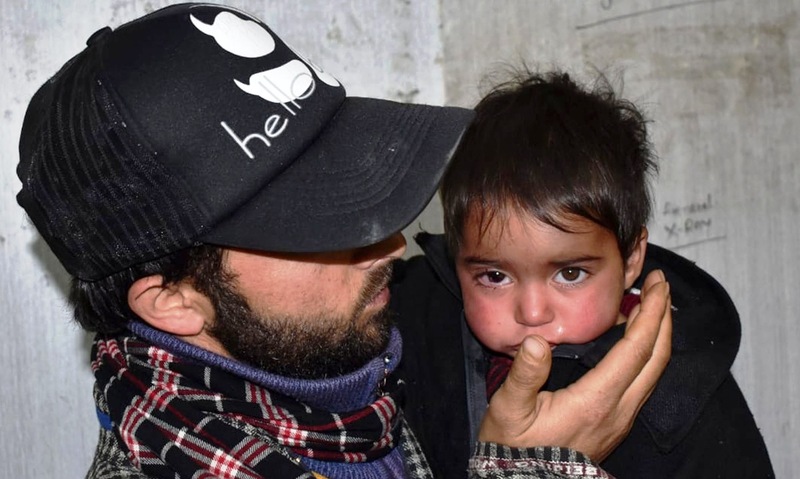 One such victim of this unending 70-year-old conflict is just a score-month-old Hiba. Hailing from Shopian’s Kapran village, Hiba was born as a dream child for her parents on March 13, 2017. She is so far the youngest victim who fell prey to pellets. On the fateful day of November 25, Hiba was at home with her mother, Marsala Jan and her five-year-old brother, Shahdat, when a metallic pellet was fired by cops, hitting the right eye of the kid and thereby damaging the cornea of her eye. Blood started oozing out of her eye and she was rushed to the hospital. After proper examination, doctors concluded that there is an uncertainty if they would be able to restore her eyesight completely. She may need multiple surgeries to regain her lost eyesight. Q: How did the incident happen and where were you at that very time? A: I was not at home at that time. A cordon operation took place in the nearby village, Batagund and later in the gunfight, six militants were killed. My wife called me and informed me about the same and I asked her to stay within the premises of the house and take proper care of the kids. Suddenly, a volley of protesters had passed through a few metres from the entrance of our house and the security personnel had started firing tear gas shells and PAVA shells to disperse the protesters. My wife along with her children was on the second floor of the house, having no windows, thereby no means of protection. The smoke spread into the entire house causing breathlessness and the kids started vomiting. She tried to open the door to let the kids breathe in fresh air. As she opened the door, she saw military personnel pointing a pellet gun toward them. She pulled the son behind while covering the eyes of Hiba with her hands. A few pellets hit her hands, while a pellet hit the right eye of Hiba. Q: What do you do and who else is in your family? A: I am a peasant and the lone bread earner of the family. I strive vigorously day and night to feed my family. I have a family of four – me and my wife and our two children. My five-year-old son, Shahdad, is the eldest and Hiba is the youngest. They both are the apple of my eyes. I wish to give my children the very best in life. For that, I try to make all the necessary sacrifices. I do overtime, all for the sake of protecting my kids’ future. But I never expected that this will happen to my little girl. She’s too little to bear the burden of blindness for her entire life. Q: Did you get any aid from the government or any other agency? A: Yes Deputy Commissioner Shopian, Owais Ahmed has provided a financial assistance of Rs 1 lakh for my daughter’s treatment. Furthermore, I am very thankful to the media persons who visited my daughter frequently and took care of all the medical expenses. Q: How’s the treatment going and how long it will take for her to get back her eyesight? A: The doctors are not sure if she’ll get her eyesight back completely. It may take her a few days, a few months or even a few years to gain her lost vision or she may have to live as a patient of partial eyesight in one eye forever. I took her for several checkups and the surgery will take place on December 11. Only then, the doctors can conclude something. Till then, all we can do is to pray for her healthy recovery.